[M. halleana], var. 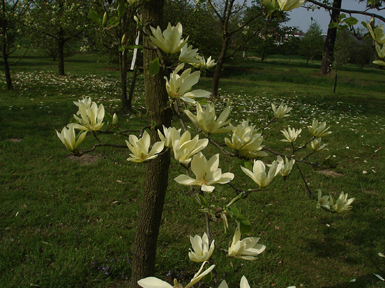 - The typical variety = M. Stellata cv. Halleana. [M. stellata], cv. (George R. Hall, brought from Japan in 1862). Later introduced by S. B. Parsons, Flushing, Long Island, N. Y. before 1875, W. Robinson in The Garden 8: 69 (1875); 12: 82 (1887); Parsons, The Garden 13: 572, T. 132 (1878), AS M. halleana. in Plant Buyer's Guide, Ed. 6, p. 182 (1958). [M. stellata], cv. (J. Blaauw & Co., Uncroft, New Jersey, in Plant Buyer's Guide, Ed. 6, p, 182. 1958), nomen nudum. Probably = M. Stellata cv. Rubra. [M. stellata], cv. 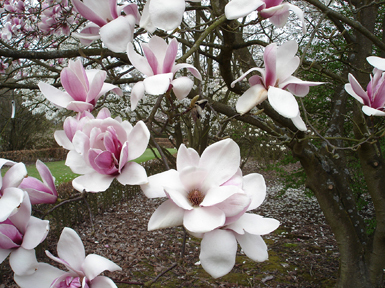 (Pickard, Magnolia Gardens, Price List, Autumn 1967, Canterbury, England), nomen nudum. May = cv. Halleana. [M. campbellii], cv. (Extr. Proc. p. 29, Jour. Roy. Hort. Soc. 789 1953), as M. mollicomata cv. Handsome Gift. Exhibited by Sir Edward Bolitho, Trengwainton, Penzance, Cornwall, England. nomen nudum. (Cv, of ssp. mollicomata). [M. grandiflora], cv. (Magnolia 20(1) [Issue 37]: 16, 1984). ‘A shrub-like form with a compact upright habit. The narrow strap-like leaves average 1 1/2 inches wide and 8 inches long, dark green above, medium green below.’ Registered by Ken Durio, Opelousas, Louisiana. [M. grandiflora], cv. (Sargent, Silva N. Amer. 1: 4. 1891), ‘narrow-leaved form with curiously undulating leaf margins.’ found in N. Italy. May = M. grandiflora cv. Salicifolia Hartwegii. [M. grandiflora], cv. (Baumann, Cat. p. 26. 1842, Bollwiller & Mulhouse, France), A new multi-flowered, dwarf hybrid between M. pumila and M. grandiflora. Compare with cv. Hartwegus and cv. Harwicus. [M. stellata], cv. (Otto Eisenhut Nursery Catalog, p, 3, 1989, Ticino, Switzerland). ‘White flowers, good form.’ = M. stellata cv. Centennial. [M. grandiflora], cv. (Bouche & Bouche, Blumenzucht2: 716. 1855), nomen nudum. Compare cv. Hartwicus. [M. grandiflora], cv. (Magnolia 20(1) [Issue 37]: 16-17, 1984). ‘A selection which produces some leaves with their margins fused to form a hollow tube the shape of a calla lily flower. This curious form was found by L. H. Harwell of Van Buren, Arkansas in a row of seedlings he planted. Described and named by Bon Hartline in Magnolia 19(1): 15-16, 1983). [M. grandiflora], cv. (Rollison ex Scott, Loudon's Gard. Mag. 18: 13. 1842). also Loudon, Encycl. Trees & shrubs 1111 (1842). 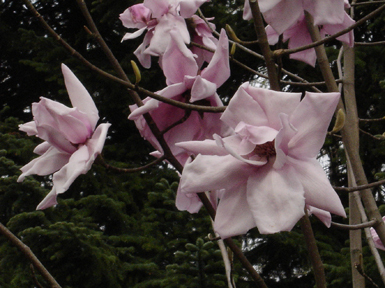 ‘Said to be raised between M. grandiflora exoniensis and .M. fuscata, and to be quite hardy...a continental variety.’ Compare with cv. Hartwicus. [M. x brooklynensis], cv. (Magnolia 22(2) [Issue 42]: 11, 1986-7). ‘Selected from a number of seedlings derived from the...cross. Flowers yellow with purple veins ascending from the base of the tepal. Only the outer whorl of tepals shows a slight green tinge. Tepals 10-12 CM. long and 6-8 CM. wide. Blooming time is 1-2 weeks later than M. x soulangeana, leafing out at the same time.’ Registered by Doris Stone, Brooklyn Botanic Garden, 1000 Washington Ave., Brooklyn, New York 11225. (M. x brooklynensis cv. Evamaria x M. brooklynensis cv. #209). [M. virginiana], cv. (J. C. McDaniel, Proc. Internatl. Pl. Prop. Soc., Meeting of Sept. 1970), described with flowers creamy-pink, 5 in. wide, tepals 12-20; seedlings bear equally double flowers. 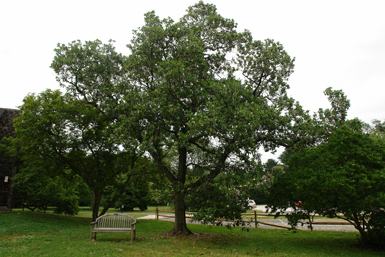 The original tree stands 28 ft. tall in Mount Pulaski, Illinois. [M. sargentiana, M. campbellii], cv. (Treseder’s Nurseries Catalog, P. 10, circa 1973, Truro, Cornwall, England). ‘A good, richly-coloured clone (iridescent).’ originated by Nigel Holman as M. sargentiana var. robusta x M. campbellil. [M. liliiflora, M. x veitchii], cv. (Magnolia 20(1) [Issue 37]: 17, 1984). ‘A Gresham hybrid bearing delicate pink flowers with lavender overtones; tight flower bud opening to a V-shaped flower’ (News. Amer. Mag. Soc. 15(2): 9, 1979). (M. x veitchii x M. liliiflora). [M. denudata, M. x veitchii], cv. (Magnolia 24(2) [Issue 46]: 9, 1989). ‘Very vigorous, symmetrical tree. Flowers white with lower half clean pink. Hardiest of twenty-four seedlings. One of very few hybrids of M. x ‘Peter Veitch’ that thrives here, unhurt. 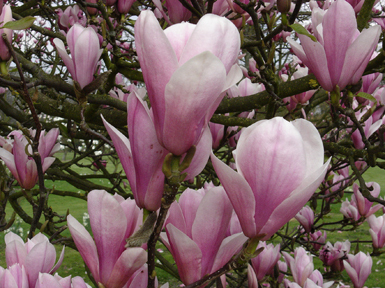 Very fertile, it is useful as a breeder of rich pink color and strong growth with excellent habit.’ (M. denudata cv. Sawada's Cream x M. x veitchii cv. Peter Veitch). [M. campbellii], cv. (Gossler Farms Nursery, Plant List, 1971, Springfield, Oregon), flowers to 12 in., deep rose color; from the Gick Collection, Eugene, Oregon. [M. virginiana], cv. (J. C. McDaniel, Amer. Hort. MAG. 46: 234. 1967), young branches pubescent, leaves evergreen, elliptic to ovate- lanceolate, dark green above, apex deflected downwards forming a drip-tip, glaucous pubescent beneath, petioles and peduncles are pubescent; flowers white, tepals 11, fragrance lemon-like, pollen very pale yellow to white. Selected from var. Australis. Type tree at Swarthmore College in Swarthmore, Pennsylvania. [M. wilsonii], cv. (Hilliers Man. of Trees and Shrubs, Ed. 2 1973). 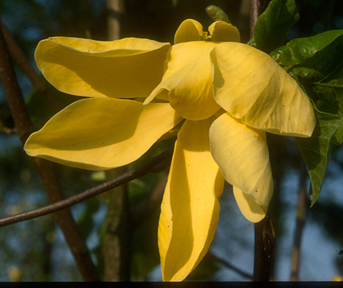 ‘It is our opinion that this plant should be regarded as a clone of M. wilsonii.’ syn. M. x highdownensis (Dandy, Jour. Roy. Hort. Soc. 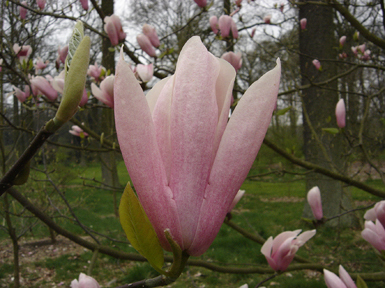 75: 159, 1950,) Purported hybrid between M. sinensis and M. wilsonii, discovered at Highdown, Sussex, among seedlings received from Caerhays Castle, Cornwall, England, prior to 1938. [M. macrophylla], cv. (Gresham, Morris Arb. Bull. 14: 24, figs. 11-15. 1963), flowers cup-shaped like a chalice, sepals green, to 7 in. long, tepals white, 8 in. long, 4-5 in. wide, basal zone ‘electric blue-violet.’ type tree in Santa Cruz, California. [M. acuminata var. subcordata 'Miss Honeybee' x M. 'Elizabeth'] cv. 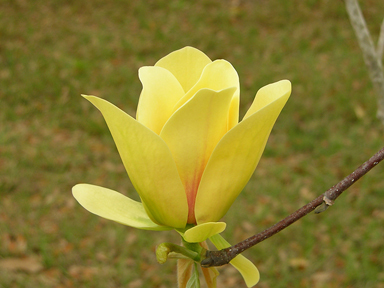 (Magnolia 36(2) [Issue 70]: 17, 2001) This is a vigorous, open-growing tree with large, bullate, dark green leaves; flowers comprised of 6-7 tepals, are floppy and a deep persistent yellow with some green at the base of the outer tepals; an untidy plant, but promising as a parent for imparting deep yellow flower color; hybridized by Dr. August Kehr; raised, selected and registered (2001) by Philippe de Spoelberch of Arboretum Wespelaar, Belgium. [M. macrophylla], cv. (Parmentier, Bull. Sci. Franc. & Belg. 27: 195, 254, 336. 1896), originated in Japan. The name ‘honogi’ or ‘honoki’ is Japanese for M. hypoleuca. syn. : M. honogi (Parmentier, loc, cit). = M. hypoleuca. [(M. x brooklynensis 'Woodsman') x M. 'Elizabeth'] cv. 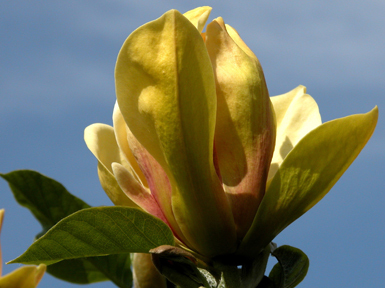 (Magnolia 35(2) [Issue 68]: 15, 2000) This hybrid produces very deep yellow flowers and is hardy in USDA zones 5-8. Hybridized, grown, selected (1992) and registered (1999) by Dr. August Kehr. [M. x soulangeana], cv. (Wister, Swarthmore Plant Notes 1: 57. 1943), nomen nudum. in Ed. 3, 1 (1): 88 (1955-56), also a nomen nudum.